Finding a bipartisan solution to funding surface transportation and other infrastructure needs remains a major challenge in Congress, according to the chair and ranking member of the House of Representatives Subcommittee on Highways and Transit. She added that “we are no further along on the discussion over money than we were four years ago” when Congress passed the Fixing America’s Surface Transportation or FAST Act. 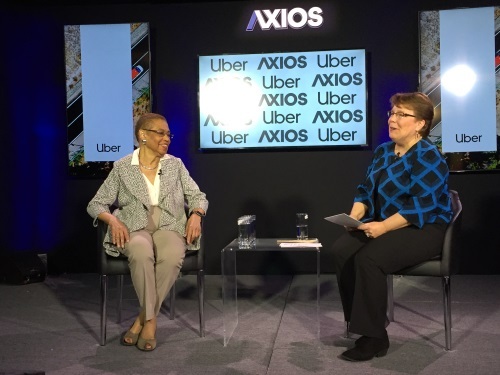 “The world of transportation has changed and the way we are supposed to pay for it is changing,” Rep. Holmes Norton explained. Rep. Rodney Davis, R-Ill., the subcommittee’s ranking member, agreed with her view, saying it is “difficult to raise the gas tax,” especially as more fuel-efficient cars and trucks along with wider use of electric vehicles is “decimating” the revenue stream feeding into the Highway Trust Fund. Rep. Homes Norton noted, however, that many states are boosting transportation funding on their own – including raising fuel taxes. “That says to me [raising fuel taxes] is not a controversial issue,” she stressed. “Congress must have guts to do what it has to do or come up with a different system” to fund transportation needs. Rep. Holmes Norton added that alternative funding methods, such as a vehicle miles traveled or VMT fee, are only being adopted slowly.